There is a lot of money invested into the cosmetics industry, which continues to grow year on year with profits exponentially booming. The cosmetic industry brings in billions in added value to the european economy a year, and even greater worldwide. The world of cosmetics has been hugely influential and sometimes revolutionary, with hundreds of cosmetic products being in high demand for decades, even centuries. The desire to keep ourselves looking young and healthy comes hand in hand with the potential for an impressive return of investment. Cosmetics can protect health, boost self-esteem and enhance wellbeing, so it comes as no surprise that revenue is prosperous. The production of cosmetic products requires the work of scientists from physics, microbiology, dermatology, dentistry, toxicology, rheology, analytical chemistry and genetics; but in the end it all comes down to their physical manufacture done in cosmetic factories that then gets shipped to shelves. As so many different people are involved in the development process, the last thing companies want is for something to go wrong at any point of development - especially to fall at the final hurdle with issues during the manufacture process. Customer satisfaction is the key to success. The cosmetic industry manufactures all kinds of products that cover all aspects of beauty and well-being imaginable; from skin, hair, teeth and virtually any parts of our body that we can care for or enhance. It is a science driven sector that is wholly supported and sculpted by skilled engineering. Engineers create original formulas which go on to be tested and finally manufactured in labs once all issues are ironed out. Another important factor of the cosmetic industry is that it can create very high levels of customer loyalty once consumers have found a product that works for them - however this can be broken instantly from bad press or a bad reaction to a product. Cosmetic concerns have grown in recent decades. The industry is not only influential in creating desirable, health & beauty products; but the sector has evolved and is moulded by greater political issues concerning the quality of products produced and how they can affect us. Within the last 5 years we have seen a greater move toward the production of eco-ethical, natural and organic products due to the growth of ethical consumerism. In recent decades, much publicity has been placed on the testing of animals within the cosmetic world, and from this, the development and running of cosmetic corporations has been guided by these issues, from development to marketing of their brand. In an ever-growing sensitive industry, we could imagine the disastrous impact if news got out of cosmetic factories not maintaining high hygiene standards and any potential rumours of contamination. For this reason, it is absolutely essential to upkeep the cleanliness of cosmetic manufacturing facilities, which is where Primasonics acoustic cleaning solutions could help. Protecting against contamination within the cosmetic industry. Just like the drug and pharmaceutical industries, the cosmetic industry must also be GMP compliant. This comes as no surprise as the products manufactured are then applied topically to parts of our body. We do not want to apply harmful substances, which is why many cosmetic products go through rigorous testing and manufacturing labs must prevent against contamination. The slightest contamination of equipment or surfaces in a cosmetic lab can create a breeding ground for bacteria, which is exactly why highly strenuous and thorough cleaning routines must be put in place and adhered to. Any slight possibility of contamination will jeopardise a batch of products, with products either having to be destroyed or withdrawn from the market if they have made it into stores. This not only results in a huge loss of time and revenue invested into production, but can damage company reputation. This is especially detrimental if you run a third party cosmetic manufacturing facility that works on behalf of big brand names. Not only could it mean a termination of contract, but it could make it hard for you to find business again with other brands in future. Hygiene monitoring is absolutely essential within this industry and disinfectant must be used as a preventative measure against any potential pathogenic microorganisms. Consistent disinfection is required, however this can be made difficult by build-up of stubborn particulate matter in equipment. Labs must prove adequate disinfection of the cosmetic production paths. The benefits of sonic energy within the cosmetic industry. The mixing of chemicals can make for messy work and has to be done ever so precisely to produce correct quantities and consistencies suitable for the market. Handling of pigments within the cosmetic market as well as other filler binder and powder materials can be made easier and more predictable with Primasonics Acoustic Cleaners. This also helps fight against contamination of products. By using sonic sound energy, materials can be dislodged and debonded in a variety of applications without damage to vessels or process plant. 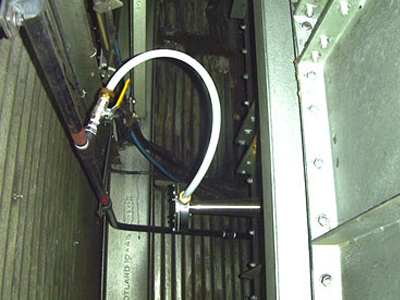 Acoustic cleaners are used for preventing build up and blockages within ducts, blenders, filters and hoppers as well as preventing ratholing in silos and removing ash build up from onsite power generation boilers. A bonus of Primasonics acoustic cleaning solutions is that all installed horns are hand-free, further reducing the likelihood of contamination from hands on labour - the highest risk of product contamination within this industry. That is not to say it will prevent contamination all together, but additional cleaning solutions will certainly help for those stubborn build-ups of particulate matter. Keeping up with industry developments. Unlike some of the other industries where Primasonics Acoustic Cleaning Solutions would be appropriate, the cosmetics industry is continuously evolving, producing new and innovative products or improving on already existing stock out in the market. Innovation within this industry is fuelled by consumer desire, which feeds the demand for labs and equipment to continuously evolve. Some products take over 5 years of research and formulation before products are approved for the market and made readily available. As so much time and money is invested into research and development, make sure money is also invested into cleanliness and the upkeep of the lab. Enhance your lab-cleaning procedures with the addition of a Primasonics acoustic horn.